Fifth grade is not for amateurs. You have to watch yourself. Kids notice stuff. What books you read. What sports you follow. What devices you own. And how nerdy you are. A little nerdy is good; you can fix the game controller. But if you're the kid who gets the teacher's website up and running so everyone has more homework... that's too nerdy. Liam figures he's in the safe zone--one third nerdy--but his third-grade sister Dakota's constant wild ideas and inventions are all nerd, and his little sister Izzy has Down syndrome and is an automatic hugger--anybody, anytime--so the chances of being embarrassed at school are almost too much for him. Then there's a new kid in his class, Moses, who's loves tennis as much as Liam does and who even has a tennis club with guest privileges, making it important for Liam to try to keep his sisters away from his new friend. But Liam and his sisters are united by the need to keep their much-loved German shepherd Cupcake, who has suddenly become inconveniently incontinent, leaving puddles all over their rundown basement apartment. Their grouchy landlord has threatened to evict the family if they don't get rid of their dog, and the vet says Cupcake needs a $3000 lab workup at the local vet school to be cured. Time is running out. Dakota banks on her idea of a drone-powered self-hovering umbrella to win the grand prize at the science fair, and Liam organizes a clean-out of the hundreds of newspapers in his friend Dodge's grandfather's house, in which Dakota discovers a trove of historic front pages to sell on eBay, but they still fall far short of $3000. And then it's Izzy herself who comes up with an alternative solution to their problem. 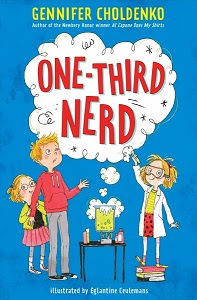 In her just published One-Third Nerd (Wendy Lamb Books/Random House, 2019), the award-winning Gennifer Choldenko gives middle readers a likable fifth-grade protagonist within a family dealing positively with their problems, most immediately keeping their family afloat and keeping their beloved pet Cupcake. As the oldest, Liam's plate is full, but his family sticks together and he gets more than a little help from his friends. As in her Newbery-winning Al Capone Does My Shirts (Tales from Alcatraz) and sequels, in this new book, humorously illustrated in humorous black-line spot-art by Eglantine Ceulemans, Choldenko provides upper elementary readers with a main character and family with the humor and cohesion of Bevery Cleary's "sticking-together" Quimbys in her Beezus and Ramona series. "Choldenko's pacing is exquisite... [A] great read," says Kirkus' starred review. "Simply endearing," says Booklist. Just what the doctor (or vet) ordered, I say, for a solid and upbeat realistic fiction novel for middle readers.